Cyclesnack: The Friday Fix: 1975 Raleigh Super Course Fixed Gear - I know this bike! 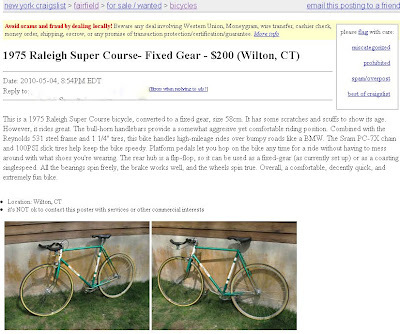 The Friday Fix: 1975 Raleigh Super Course Fixed Gear - I know this bike! Hey, I know this bike! Looks like the new owner made some changes, different saddle, bullhorns, and new slicks. Very nice! Not sure I like the brake lever choice, if you are doing bullhorns you should only use aero levers, any thing else looks gauche. Never-the-less, I hope it goes to a good home where it gets lots of use.